All of your household wastewater exits your home through a pipe to the septic tank. OR IT SHOULD! Gray Water Discharge other than into the Septic Tank IS NOT ALLOWED. 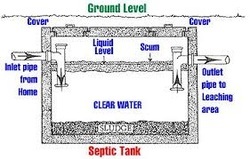 The septic tank is a buried, watertight container typically made of concrete, metal, fiberglass, or polyethylene. It holds the wastewater long enough to allow solids to settle out (forming sludge) and oil and grease to float to the surface (as scum). It also allows partial decomposition of the solid materials. Compartments and a T-shaped outlet in most septic tanks prevent the sludge and scum from leaving the tank and traveling into the drainfield area. The wastewater exits the septic tank and is discharged into the drain-field for further treatment by the soil. The partially treated wastewater is pushed along into the drain-field for further treatment every time new wastewater enters the tank. If the drain-field is overloaded with too much liquid, it will flood, causing sewage to flow to the ground surface or create backups in plumbing fixtures and prevent treatment of all wastewater. Septic tank wastewater flows to the drain-field, where it percolates into the soil, which provides final treatment by removing harmful bacteria, viruses, and nutrients. Suitable soil is necessary for successful wastewater treatment. 3. Don’t dispose of household hazardous wastes in sinks or toilets. 4. Care for your drain-field. There are a few things to remember when purchasing property at the Lake of the Ozarks. In most cases the area that is used as the Field is usually smaller on older homes and a lot of Septic Tanks and Fields are close to the water. Any System can have small issues, such as maintenance items; a tank that needs pumping, and electrical issue with any mechanical components that may be in-place, screens and lids. More important concerns: are sewage surfacing issues, cracked tanks or lines, backups, or systems leaking into the ground water we drink or into the Lake of the Ozarks that we all play in. While completing a State Certified Septic and/or Lagoon Inspection, the State requires that the well head be inspected and well water be tested for bacteria. The State does not require a complete breakdown of the water quality for metals, bacteria, lead, PH and others which can be done if requested but can become very expensive. Septic Tank Locating using a electronic tracer can be used to help in location of the tank in most cases. 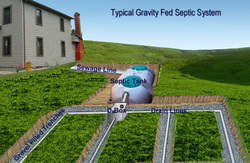 ​Septic Line camera service using a state of the art snake camera and color monitor. (Recording not available). HOW DOES A LAGOON SYSTEM WORK? A typical lagoon has two main components: a pipe from the home and the area specified as a waste area or lagoon. Everything that goes into the drain then flows into a waste-pond or lagoon. Microbes in the water and soil digest or remove most contaminants from wastewater before it eventually reaches groundwater. The Lagoon must meet specific conditions for the safety of both human and animal life. Ask your Certified Inspector for details. Septic and Lagoon Systems must meet State and/or County requirements based on certain criteria. Lending Institutions, FHA, VA and/or Insurance Providers can require a private OWTS to be inspected. The Inspection must be completed by a State Certified Inspector. Whenever a State Inspection is performed a Well Water Test is Required. ​Ask your inspector questions, it helps prevent surprises. In all cases it is recommended that any Private Waste Water Treatment System be inspected so that you have information to be able to make an informed decision on the purchase of the property.